From the creation of the volcano potato and the bacon cheeseburger onions rings it was only mean to be merged to create the bacon cheeseburger potato. An easy simple recipe that can be changed in many ways to adapt to your personal taste preferences with most types of ground meats, sausages, cheese or deli meats. Be creative with the flavours you like to taste. To go over this recipe while keeping it easy for everyone to understand I'll go threw the entire process here with ingrediendts and measurments for 1 potato then just multiply the ingreidents for the number you choose to make. Start with a large potato. I prefer a baking russet potato that are easy to find while usally having a uniform shape making it easier to work with. See which way the potato sits flat the best then choose a top. Give then a good wash then poke a few hole to let steam escape just directly in the top. Partialy cook the potatoes unitl there tender inside. I prefer to toss them on the barbecue for a little smoke flavour and a cripser skin. To do this step quicker a microwave or boiling water works as well. Let the potatoes cool enough so there safe to handle. Take a small knife and cut a rectangle into the chosen top side where the hole are. Slicing sideway a bit remove the top and set aside. Slice off the excess potato from the top leaving ½ to ¼ inch on. Using a spoon scopp out the middle of the potato and set aside in a bowl. The leftover poatoes and bacon was used for breakfast the next day so nothing was wasted or just make some mashed potatoes. Fill the potatoes with any type of filling you like with many different ingreidents. Keeping it simple I use 4 ounces of meat for each potato and a ¼ cup of cheese but this can be different depending on the sixe of the potatoes so adjusts amount accordinly. Seasoning I use a delicious mix of salt and pepper with fresh chopped garlic. 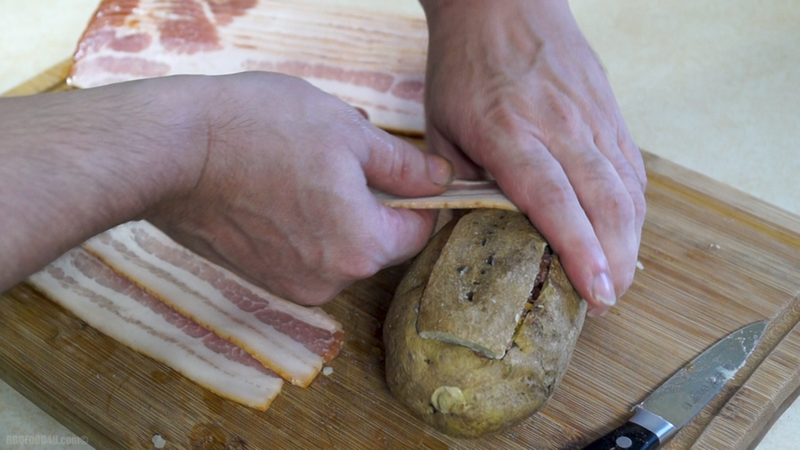 Place the top back on the potato then wrap each one with 3 strips of bacon pulling firm while wrapping it around. Use toothpicks to help pin the bacon down better if needed. 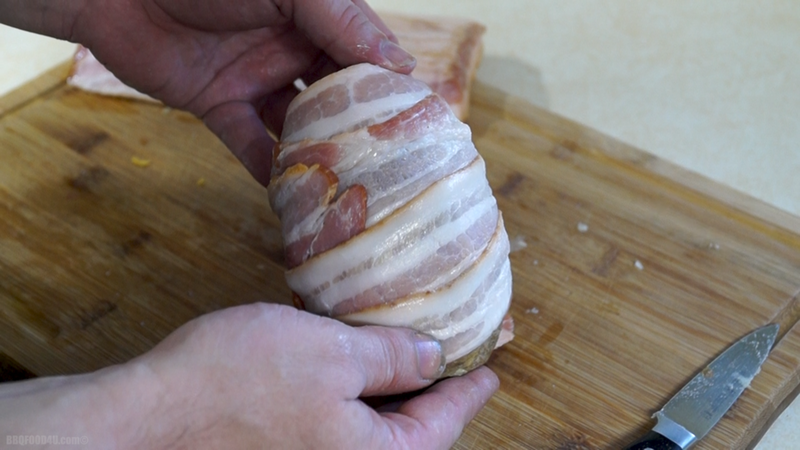 For even more bacon wrap the potatoe up using a bacon weave and slice off any excess. Setup your barbecue for indirect cooking at 350*F get the potatoes on. Sit back and relax while they cook because with this easy recipe there's not much to do for 40 minutes but leave the lid closed while letting the smoke roll. After 30 minutes it's easy to see the bacon is looking good with a nice kiss of smoke. After cooking for 45 minutes the bacon was cooked perfect and the meat hit a safe internal tempture. A coat of sweet and sticky BBQ sauce was applyied. Close the lid while letting the sauce setup for 5 minutes. Here's a picture of the bacon cheeseburger potato sliced down the middle after fully cooked. To put it all together here is a quick 4-minute video I made for this recipe as well. Please share this video with your family and friends. Original creations don't get searched for because no one knows about them. All the content, recipe, video, pictures, filming, editing and posting all done by me, Jason King.